The bracelet was antique, gold and garnet, a present many years back from the querent's husband. She noticed it missing the previous weekend when she wanted to wear it, but at the time she had to go out, so was unable to search for it properly. She had just finished a thorough search at the time of the question. The querent was upset because she couldn't remember the last time she had worn it, and didn't know whether it was misplaced at home or had dropped from her wrist on an earlier night out. She was keen to find it, if possible, before mentioning the loss to her husband. Can you help? The querent is signified by Mercury (combust in the 8th) and co-signified by the Moon. The combust state of the main significator is something to be considered. It might indicate that the querent is hiding the truth, incapable of understanding her own involvement in the situation, or that she is in fear or will be resistant to my advice (Christian Astrology, p.123). 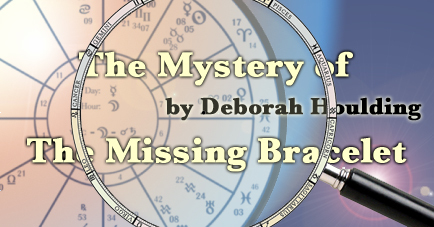 Since the querent admits she had no idea whether she misplaced the bracelet or lost it, there seems no reason to doubt her honesty or her willingness to explore the matter astrologically. More likely it shows her anxiety at the time of the question, and her concern over finding the bracelet before the need to tell her husband she has lost it. This might be indicating a bigger problem in the querent's life, which is revealed incidentally by the symbolism of this chart, but is not directly related to the discovery of the bracelet. The bracelet is signified by the 2nd-ruler, and is also co-signified by the Moon. 2nd-ruler is Venus, an appropriate significator for an item of jewelry; its placement in a Mars-ruled sign is descriptive of the red garnet stones. The Moon is also descriptive in Gemini - the sign that rules the arms and hands - and being conjoined with Saturn describes the item as antique. 2nd-ruler is in the 7th - suggesting that someone else could be involved. There does not seem to be strong indications of theft because the 7th house is not holding malefics and is ruled by a benefic planet, and the Moon's application to Venus by sextile suggests the prospect of an easy or quick recovery. Maybe the item has inadvertently been placed amongst another person's things, or someone else has taken it or moved it? Or could this placement represent the fact that although the bracelet is the querent's, given to her as a gift, she does not recognise her ownership, but sees it as the husband's bracelet because he purchased it? 2nd-ruler is in detriment - suggesting that the bracelet is not in a place where it should be; its location is not inappropriate for an item of jewelry; it may be suffering damage, especially since Mars is on the cusp of the 4th house (which signifies where the bracelet lies or has been deposited); the 4th ruler (Jupiter) is also in detriment (indicating an unsuitable location or unsupportive environment); and the Moon conjunct Saturn also suggests an 'unhealthy' location. 2nd-ruler is in a fire sign - it is near a source of heat. Or perhaps, because it is in Aries, it is near to something red or made of iron? A hot location is also suggested by the 4th cusp in a fire sign and Jupiter on the 4th house cusp (the close proximity of Mars to the angle makes it especially worthy of attention). 2nd-ruler and the Moon both close to sign boundaries - suggests a location close to a wall or partition (CA., p.203). The significance of a wall or a location near bricks is also suggested by: the Moon and 4th-ruler in Gemini (CA., p.94); 2nd-ruler in Aries (CA., p.93); 4th house cusp in a fire sign (alBiruni), and Moon conjunct Saturn. Because of the good indication for recovery given by the placement of the 2nd-ruler in an angular house, and the Moon's positive application to it by sextile, my judgement was that the item was within the home and would be found with another search. However, whilst applying to Venus, the Moon must first perfect its almost exact conjunction with Saturn. Before reading what actually happened (next), look at the above notes and any extra observations that you can make for yourself. Can you discover where exactly the missing bracelet was? Have a think about what suggestions you would have made to the querent with regard to where she should concentrate her search, and then read on to see how close you came to discovering what happened. The main themes in the chart are that the bracelet is out of place, near to a wall and a source of heat. Mars on the IC implies that heat lies below it. With the 4th-ruler in an air sign, and the Moon conjunct Saturn with it in Gemini, I suggested that the querent should look around windowsills over radiators. The lack of emphasis on earth signs argued against the bracelet lying on the floor. The querent had ornaments and trinkets on her windowsills, but she replied that she had already checked those before the question. I advised another search and recommended that she also consider shelves, and places near to books (Gemini) and candles (Mars). Although the air signs tend to signify places that have easy access to light, the Moon's close conjunction with Saturn argued that the bracelet was in a dark place, either behind something, or inside something like a box, trinket or set of drawers, (chests and drawers also fall under the signification of Gemini: CA., p.94). I said the direction west might be indicated, because of the 2nd-ruler's placement in the 7th and the Moon and 4th-ruler in an air sign, all of which relate to the west. The querent called back just over half an hour later later. She had followed the suggestions but had still not found the bracelet. I had nothing more to offer except my conviction that it would be found. Maybe the Moon's conjunction with Saturn presented an obstacle that had to be overcome first? Perhaps this was dealing with her fear of raising the matter with her husband? Since the 2nd-ruler is in the 7th, it was possible that he was the key to the discovery. About 20 minutes later the querent called again, this time to report that she had found it. During earlier searches she had not remembered a radiator behind the tall and heavy dressing table upon which her jewelry was kept. She had earlier searched underneath the dressing table and inside the drawers but my suggestion for windowsills over radiators had thrown her, because this radiator was not near a window or in any way exposed to light. On the other hand, my insistence that the bracelet would be found and was deifniately inside the house made her determined to keep up the search with my other points in mind. After moving the dressing table out of the way, she found the bracelet hanging on a wall bracket which fixed the radiator to the wall. The time of discovery was 4:16 pm. The Moon had just separated from its conjunction with Saturn by about 2 minutes of arc. When we look at a chart with the benefit of hindsight, we finally get to see the clarity that was there all along! In hindsight I wonder why I did not take more notice of that Moon-Saturn conjunction in Gemini from the start - the perfect depiction of a heavy set of drawers acting as an obstacle to discovery. But these charts are like puzzles, a part of which always remains slightly out of focus until the event is over and the last piece falls into place. We might have great confidence in what the chart is saying as a whole, but something frustratingly obscure remains. What, for example, was the 7th house significance in this chart? The querent did not know how the bracelet became lost, but one of the rules related by William Lilly in his Christian Astrology is that where the significator for the item separates from Saturn in a cadent house then it may have fallen to a place where it is lying neglected or suffering damage (CA., p.334). It was not found amongst anyone else's things, nor was anyone else suspected of moving it. And yet several features in this chart warn of relationship problems for the querent, and not long afterwards she consulted me about problems in her marriage that are symbolically alluded to here: Venus in detriment in the 7th and Moon conjunct Saturn, Mercury combust, and Mars on the IC - all of these foreshadow the problems of emotional isolation, inhibited self-expression and fear of arguments that the querent was to reveal in a later consultation. The desire to keep her anxiety hidden from her husband was a telling reflection on how she feared the discomfort of his knowledge rather than the reassurance of his help. 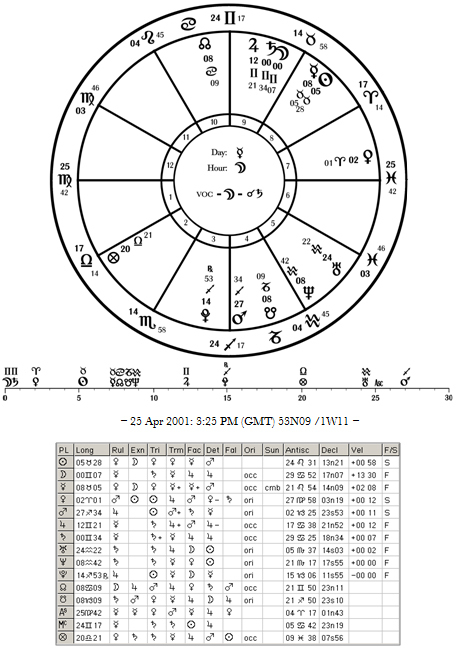 The message of the chart was accurate and its significance flowed over into a horary that was yet to be asked, but the 7th house theme was not the means to the discovery in this chart. Neither was my suggestion of the direction west much help to the querent - it confused her because the wall where the bracelet was found faced east. It was this chart that made me realize how, in the judgement of direction, we often overlook the need to identify a personal starting point. When we locate a missing person or animal, we usually take the home or the place of last sighting as the point from which to seek directions. If the querent had stood in front of her jewelry box and sought west she would have been faced by the wall on which it was found. But that some element of mystery remains until we receive the benefit of hindsight should not frustrate us too much. We are working with symbols, and it is our role to interpret the symbolism as effectively as we can within its context. But it is the querent, not the astrologer, who makes the final judgement. This was a light hearted approach towards viewing horary as a mystery game, and yet the reality is that our horary judgements are never more than clues, something that our querents must make sense of in order to find the answer for themselves. © The article made available on this page is copyrighted to Deborah Houlding and is offered here for private, non-commercial use. Permission must be sought for reproduction. Published online July, 2010.